ST. LOUIS (AP) The Cardinals slumping bats remained quiet through a 95-minute rain delay. Once they were able to get going, they never cooled off. Jose Martinez drove in five runs and had four hits to help the Cardinals rout the Philadelphia Phillies 12-4 on Friday night. Francisco Pena homered and also had a single and double for the Cardinals. Despite the margin of defeat, Phillies manager Gabe Kapler had plenty of praise for Florimon. Despite the rain delay, Wacha held his opponent to two or fewer runs for his sixth consecutive start. Martinez’s four hits matched his career high set on April 12 at Cincinnati. Pena’s home run made him and his father Tony the second father-son tandem in Cardinals history to hit home runs for the franchise. They join Ed and Scott Spezio in accomplishing that feat. Cardinals: SS Paul DeJong was placed on the 10-day disabled list with a fractured fifth metacarpal on his left hand. 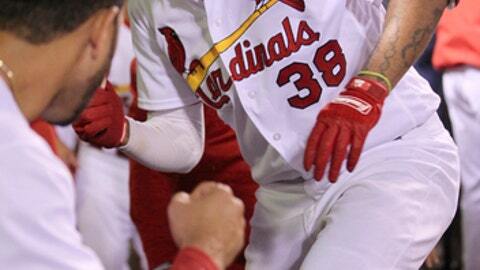 DeJong injured the hand after being hit by a pitch in the eighth inning of Thursday night’s game. The team also placed RHP Matt Bowman on the 10-day disabled list with blisters on his right index and middle fingers. The club recalled INF Yairo Mu�oz and OF Tyler O’Neill from Triple-A Memphis.